Every baseball fan can understand batting average. Surely, if you ever played little league, you would occasionally find yourself computing your game batting average mid-game. Every team would have somebody keep everybody’s batting average. It’s fun, because it’s easy to understand and it’s easy to calculate. It tells you one thing – did the batter get a hit or not – and it does it in a very simple way – it’s pure and simple division. It doesn’t make you include bunts or walks like OBP, it doesn’t make you keep track of total bases like SLG. It certainly doesn’t make you memorize constants for some complicated multinomial expression like wOBA. This simplicity is what makes it such an easy tool for analysts to use, whether they’re armchair analysts watching the game with you in the living room or on the air for Baseball Tonight. Of course, simple doesn’t always mean better. Guys like Bill James, Rob Neyer, Pete Palmer, and all our other sabermetric heroes have been letting us know this since the 1970s. That is not to say that batting average is a completely useless stat – it just doesn’t correlate with run scoring nearly as well as OBP, SLG, or linear weights. For those less familiar with wOBA, let’s take a look at results from 2009. The following graphic shows batting average on the horizontal axis and wOBA on the vertical axis, so we can see how the two are related. The correlation coefficient (r^2) for the regression line shown above is .36. Briefly, that means that although there is a positive correlation between the two statistics, it is not very strong. 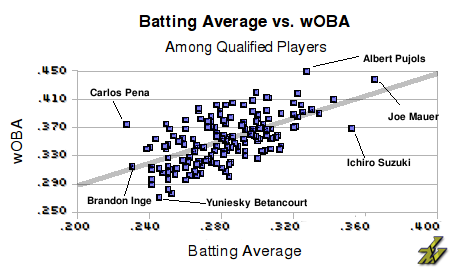 As we see with guys like Carlos Pena, having a low batting average doesn’t necessarily lead to a low wOBA. Conversely, with guys like Ichiro, having a high-percentile batting average doesn’t necessarily lead to a similarly high-percentile wOBA. That isn’t to say that it doesn’t help – getting a lot of hits will increase a player’s wOBA just as it increases any other offensive statistic. What sets players apart isn’t whether or not they get hits, of course. What sets players with the same batting average apart is (a) what they do with their hits – SLG, or more aptly measured by Isolated Power (ISO, SLG-AVG), and (b) their ability to take walks – OBP, or more aptly measured by Isolated Discipline (OBP-AVG). That’s why Carlos Pena (IsoP – .310, IsoD – .129) is a better hitter than Yuniesky Betancourt (IsoP – .106, IsoD .029) and Brandon Inge (IsoP – .176, IsoD – .084), and why Albert Pujols (IsoP – .331, IsoD – .126) is the best hitter in the game. We hoped you liked reading Relating Batting Average and wOBA by Jack Moore! Love what you’re bringing to the table, Jack. Just one question – mathematically, does IsoD make any sense? You’re subtracting two numbers with different denominators, and I’m not sure what you get means anything. I get that, generally, the larger the OBP, the more patient the hitter, but it doesn’t really relate directly like that, right? If a guy, in 600 PA, has 100 hits and 100 walks, he’s got a .200 BA and a .333 OBP. If he’s got 150 hits and 100 walks, he’s got a .300 BA and a .417 OBP. Same number of walks in the same number of PA, but his IsoD changes based on the number of hits he got. Yeah, I wanted to work with IsoD before, but realized that the fact that they have different denominators makes it so that it doesn’t “isolate” anything like ISO does (ISO being essentially Extra Bases/AB). Jack, of course in principle I agree that walks are good, the emphasis should really be on OBP. If you have a high OBP, it doesn’t really matter how you do it. It’s just that for good OBP’s (let’s say .360), a number of hits plus walks is a lot easier to attain and sustain than an equal number of just hits, so it’s really rare to see guys like Ichiro who don’t walk and get great OBP’s. I agree with Michael that the focus of too many is on walks than on getting on base more. Walks are important in relationship to how often the batter strikeouts but I think too many people short-hand “Walks good” and don’t understand the nuance that, looked at in an isolated basis, a hit beats a walk anyday. I’ve been thinking about this instead of listening in class – as a commenter below pointed out I kind of like the idea of H/PA being used to calculate IsoD.